Chances are, if you’re checking out this article, you’re a waterfall-chasing kind of rebel who has caught wind of Kaaterskill Falls. Kaaterskill falls does not disappoint and is a must-see for anyone who loves the perfect combination of hiking and a waterfall rush. If this is you, you’ve come to the right place. In this article, we outline everything you need to know about Kaaterskill Falls, including how far it is, why it’s one of the most popular hikes in the area, and what you need to know before you head out. KAATERSKILL FALLS: WHAT ABOUT THEM? Kaaterskill Falls offers one of the most popular hikes in Greene County, for a couple reasons. First, not many people dislike waterfalls. If you do, you’re probably a sourpuss. So, assuming you’re not a sourpuss, and you’re a fan of waterfalls, why not combine your weekly hike with a magical cascade of water? 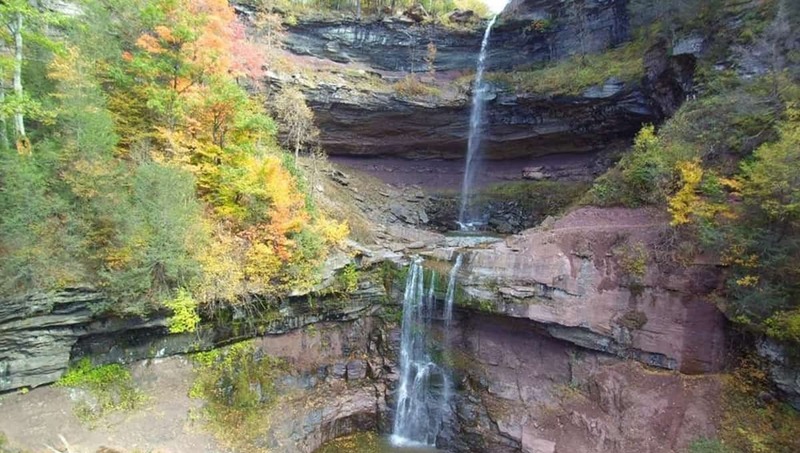 Also, the trek to Kaaterskill Falls tends to be fairly short and leads to a huge, 260-foot treasure. While the Great Northern Catskills holds many natural beauties and landscape treasures, arguably, the crowning jewel is the Kaaterskill Falls, the highest cascading waterfall in New York. Falling in two different tiers over 260 feet, Kaaterskill Falls has been one of the most popular destinations in the region for many centuries. However, Kaaterskill Falls isn’t just a popular tourist destination. To the Native Americans, Kaaterskill Falls is believed to be the creator’s resting place: a sacred spot for the Mohicans who call the Catskills home. Through its history, folklore and pure beauty, it’s captured the hearts, paint brushes, and pens of many poets, painters and photographers, sharing its beauty and mesmerizing power with the rest of the world. You can take a slice of this nature magic too. All you need to do is find a car, bus or hitch a ride heading down New York State Thruway to Exit 21. Alright, so you’re in your car, a bus, or a (hopefully not creepy) stranger’s vehicle. You’re heading down New York State Thruway towards Exit 21 (Catskill). What you or your diver will want to do next is take a left off the NYS Thruway entrance road and head straight for ¼ of a mile. Then, you’ll turn right onto Route 23 West and drive for 6.6 miles to Cairo, NY. You’ll then take a left onto Rt. 32 (a McDonald’s restaurant will be on the corner). Continue on for about 7.7 miles, then take a right on Rt. 23A. You’ll drive for about 6-7 miles on this road until you hit a horseshoe turn near Bastion Falls. Park ¼ mile past the falls at Rip’s Lookout. This trip is about 4 miles from Palenville. Alternatively, since this hike is extremely popular, you can just type in Kaaterskill Falls Trailhead into Google Maps and it’ll take you to where you’ll need to do. Start on the trailhead from the parking lot by walking downhill along Route 23A, keeping yourself visible for driver who are passing. Crossover Spruce Creek on the bridge, then look for the trailhead kiosk on your left at the bottom of Bastion Falls. Follow the Yellow Trail as it steep rises with the creek at your left. You’ll only need to walk for about 20 minutes until you see the two-tiered beauty, standing tall and fantastically before your very eyes. You can continue climbing high enough to see the Hudson River Valley as it twists and turns below you, as you soak up the incredible wonder of one of New York’s most incredible natural beauties. While hiking, keep track of your path as many hikers have created separate paths from the main DEC-blazed trail. By staying aware and keeping safe, you and your pals will be able to enjoy the incredible views of one of the most stunning locations in New York State. Now that you know exactly how to get to Kaaterskill Falls, how long it will take, and what to look out for, it’s time to pack your bags and take down some tips from the pros. We’ve compiled an 5-point tip list to help make your experience at Kaaterskill Falls as magical as the cascade itself. While this may be obvious to some, unfortunately it’s not to everyone. 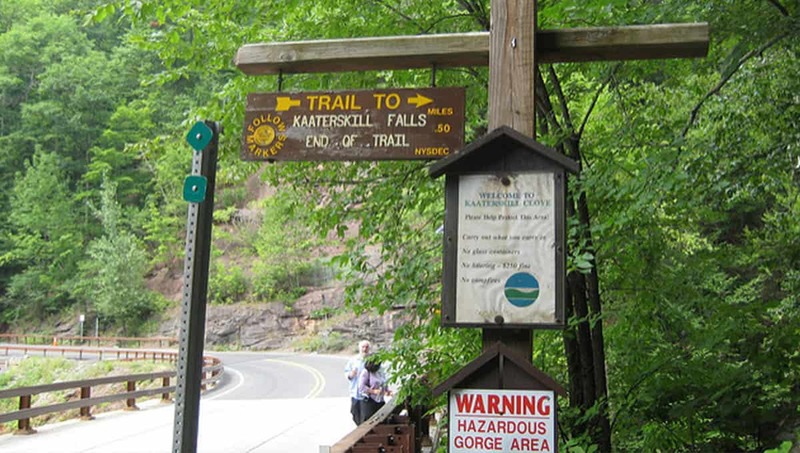 While hiking Kaaterskill Falls trail, you may see other makeshift trails veering off from the main trail or into the woods, but don’t follow these trails. Taking and making shortcuts can lead to trail erosion which leads to becoming lost and/or injured, or worse (explained more below). While this sounds like an awesome time, climbing the rocks around or under the waterfall has led to numerous injuries. Even if you’re a rock climbing pro (or think you’re a rock climbing pro), the rocks in this area are extremely slippery which is, needless to say, extremely dangerous. Proper shoes include hiking boots or athletic shoes with sturdy ankle support. Don’t wear flip-flops, sandals or parade around in your bare feet. And whatever you do, don’t attempt to hike Kaaterskill Falls Trail in your high-heels. Although there’s a lot of hiking around the water, swimming is also discouraged. Once you get to Kaaterskill Falls, chances are you won’t want to leave right away. Come prepared in order to make the most of your trip. Make gourmet sandwiches, or stick with classic PB and J, learn how to bake some hiking protein balls, pack a few canned craft beers or smoothies. Along with your bag of goodies, make sure you bring a blanket or something to hang out on comfortably. Also, make sure you don’t bring any glass. Whatever trash or food you bring onto the trail and to the Kaaterskill Falls, you bring out with you. While this seems like a general rule to follow, there’s actually a $250 fine for littering the Catskills. Yes, there are quite a few rules on this fun list, however, all you really need to do in order to stay safe and enjoy yourself is to focus on the beauty that surrounds you. While the wilderness is a special place in itself, this area is particularly unique. By admiring and paying attention to the natural wonders around you, you’ll be able to create a memorable experience to cherish for years to come. There are many signs and stories that make it clear hikers shouldn’t wander off the trail due to the injuries and deaths that come from getting a bit creative with making their own trail. While there are many tragic stories from the past, these warning are still very relevant. Even after the trail extensions, improved signage, and safety fencing, many people have still gotten killed or seriously hurt. While these instances involve very different circumstances and details, many of the stories included a common thread: almost every single person who hurt themselves on the trail started down their specific trail of tragedy by leaving the marked trail and ignoring the many warning signs and fencing. That’s why it should be noted that if you wander off the trail, you’re endangering your own life along with those who you’re with and the lives of others who may attempt to rescue you. While Kaaterskill Falls is a beautiful, popular, and fun area, you should remember you’re in a location that includes many cliffs, wildlife, and walking ground you’re not used to. On the other hand, if you stick to the marked trails, there’s no more danger than you’ll find on a basic staircase. It’s up to you. However, we highly recommend you take our advice. The alternate Catskills hiking route leads you to the top of the falls, starting from Laurel House Lane is the North Lake Road following Route 23A. Make sure you take precautions while hiking along this path as water and erosion can create slipper conditions. When in doubt, use common sense and avoid loose rocks and slipper-looking stones. And of course, have a blast. Kaaterskill Falls has been wildly popular for a reason. It’s now time to find out why for yourself. Cataract Falls: Is It Worth It To Come And Visit This Place?